Sawpitts Green is located in Richmond Road. In 2013, Towcester WI commissioned a commemorative stone to mark Queen Elizabeth's Diamond Jubilee. 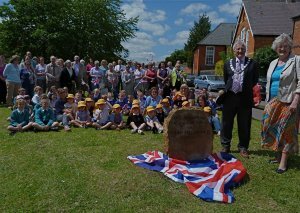 The Town Mayor unveiled the commemorative stone on 3rd June 2013 at an event attended by the children of Towcester Primary School.